Harry Laverne Anderson (October 14, 1952 – April 16, 2018) was an American actor, comedian and magician. He is best known for the role of Judge Harry Stone on the 1984–92 television series Night Court. He was also known for his role as Richie Tozier in the 1990 Stephen King miniseries It. Anderson also starred as Harry 'The Hat' Gittes in Cheers. He was born in Newport, Rhode Island. In late January 2018, Anderson suffered several strokes which declined his health and later suffered from influenza. On April 16, 2018, Anderson died in his sleep of a stroke caused by influenza at his home in Asheville at the age of 65. He was 65 years old. ↑ "Harry Anderson's Death Certificate" (PDF). TMZ. April 24, 2018. Retrieved April 24, 2018. ↑ 2.0 2.1 "Harry Anderson: Biography". Turner Classic Movies. Retrieved April 16, 2018. ↑ Schwartz, John (August 30, 2006). "For Harry Anderson, the New Orleans Magic Is Gone". The New York Times. Retrieved August 23, 2016. ↑ 4.0 4.1 Shanely, Patric (April 16, 2018). "'Night Court' Actor Harry Anderson Dies at 65". The Hollywood Reporter. ↑ 5.0 5.1 "'Night Court' Star Harry Anderson's 9/11 Transcript Released". TMZ. April 19, 2018. Retrieved April 20, 2018. 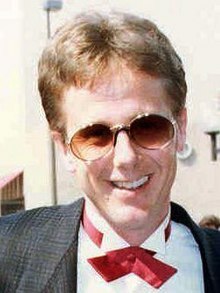 ↑ 6.0 6.1 "'Night Court' Star, Harry Anderson, Dead at 65". The Washington Post. April 16, 2018. Retrieved April 16, 2018. This page was last changed on 27 June 2018, at 04:19.